(Portland, ME)--- Reading Phillies first baseman/outfielder Darin Ruf has been selected as the winner of the 2012 Eastern League Most Valuable Player Award and the 2012 Eastern League Rookie of the Year Award as announced by the Eastern League early Thursday night. With his sweep of the awards, Ruf becomes just the third Reading Phillies player to do so following Marlon Byrd (2001) and Ryan Howard (2004). Ruf is the sixth R-Phils player to win the MVP award, joining Greg Luzinski (1970), Mark Davis (1980), Jeff Stone (1983), Byrd, and Howard. Along with Pat Burrell (1999), Byrd, Howard, Chris Roberson (2005), and Michael Taylor (2009), he also becomes the sixth player in team history to win Rookie of the Year. Ruf is batting .320 (150-for-469) with 32 doubles, 37 home runs, 98 RBI, 91 runs scored, a .629 slugging percentage and a .412 on-base percentage in 135 games in his Double-A debut for the R-Phils this season while helping lead the team to second place in the Eastern Division with a record of 73-64. The 26-year old currently leads the Eastern League in home runs (37), RBI (98), extra-base hits (70), total bases (295), slugging percentage (.629), on-base percentage (.412) and OPS (1.041). He is also among the league leaders in games played (134-tied-1st), runs scored (91-tied 2nd), batting average (.320-2nd), walks (65-tied 3rd), hits (150-3rd) and doubles (32-tied 4th). With his performance this season the 6'3", 220 lb. slugger has etched his named into the Reading record books, tying Ryan Howard's single-season record of 27 home runs set in 2004 and breaking Greg Luzinski's single-season record for total bases (287) that was set in 1970. He also was the first player in the team's 46-year history to notch 30 doubles and 30 home runs in a single season. The pair of awards adds to the collection the slugger is racking up at the end of the 2012 campaign. On Wednesday, Ruf was named the recipient of the Paul Owens Award, presented to the best player in the Philadelphia Phillies farm system. 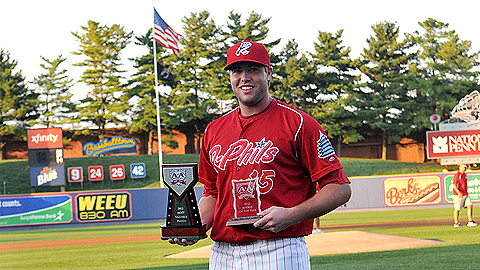 Ruf also was named FirstEnergy Team MVP and Reading Eagle Big Stick Winner prior to Wednesday's game. Ruf, who is a native of Omaha, Nebraska, was selected as the first baseman on the recently announced 2012 Eastern League All-Star Team. He was also named the Eastern League Player of the Week for the periods of May 7th-May 13th and August 13th-August 19th and was also the starting first baseman for the Eastern Division at the 2012 Baseballtown All-Star Classic and went 1-for-1 with a double, one RBI, one run scored and one walk. Ruf, who is hitting .335 with 19 home runs, 31 RBI and 27 runs scored in 28 games during the month of August, was selected by the Philadelphia Phillies in the 20th round of the 2009 draft after he batted .331 (275-for-832) with 57 doubles, 27 home runs, 201 RBI and 159 runs scored in 227 games during four seasons at Creighton University. He was named the Missouri Valley Conference Player of the Year during his sophomore season when he hit .374 with eight home runs and 57 RBI in 61 games. New Britain first baseman Chris Colabello finished as the runner up in the voting for the MVP award and Akron outfielder Thomas Neal finished in third place. In the Rookie of the Year voting, Bowie shortstop Manny Machado finished in second place and Portland outfielder Jackie Bradley Jr., Erie third baseman and outfielder Nick Castellanos and Richmond starting pitcher Chris Heston tied for third place. Both awards were voted on by Eastern League team managers and media members.